Fantasy football is all about value. Brandin Cooks was a nice 3rd round pick last year, but Michael Thomas was just as good and he was available in the 11th round. A.J. 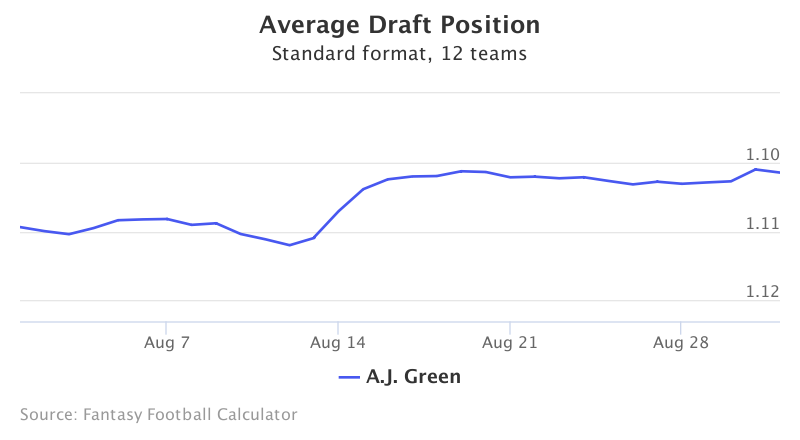 Green might be the LeSean McCoy of WRs in this year’s drafts. He’s going as WR5 almost by default and is a top ten pick despite the fact that he’s never finished as a top ten player. This is not the A.J. Green of 2013 and 2014 anymore. He’s settled in around nine targets a game, down from 11 early in his career, and is becoming less of a redzone threat as the Bengals turn to Tyler Eifert and other targets. Green has averaged 13 games over the past three years and is developing a troubling pattern of coming up lame right as fantasy playoffs kickoff. Like McCoy, he is all downside and little upside as a 1st round pick. 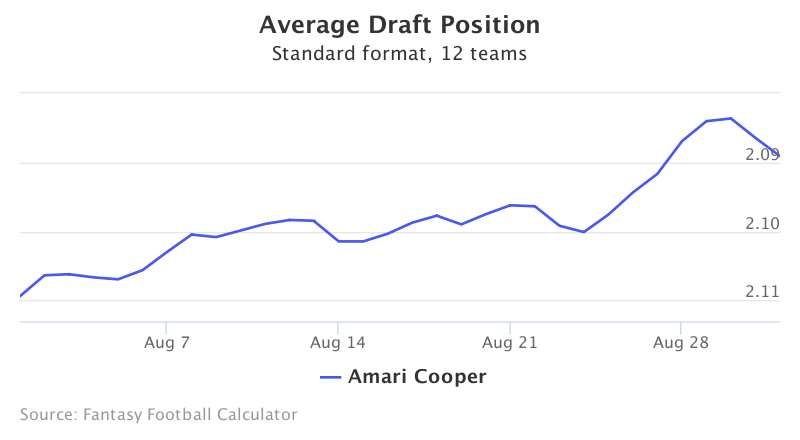 Amari Cooper is going in the 2nd round for a second straight season as fans eagerly away his expected breakout. The problem is Amari showed precious little improvement last year from a fantasy standpoint and may not even be a true #1 receiver on his own team. 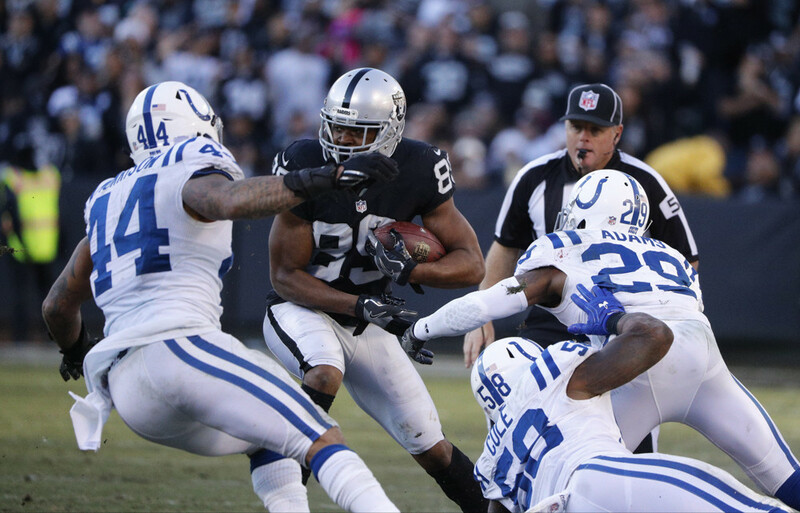 Cooper has seen fewer targets both years than teammate Michael Crabtree. He had more targets than Crabtree in just six games last year, and Crabtree is the more consistent redzone threat. Cooper’s talent may someday merit a draft pick this high, but the opportunity just isn’t there right now to merit a spot among the top ten receivers. Brandin Cooks was a top ten 2016 WR for New Orleans, and a trade to the Patriots had owners salivating even before a Julian Edelman ACL tear sent Cooks’s ADP skyrocketing. 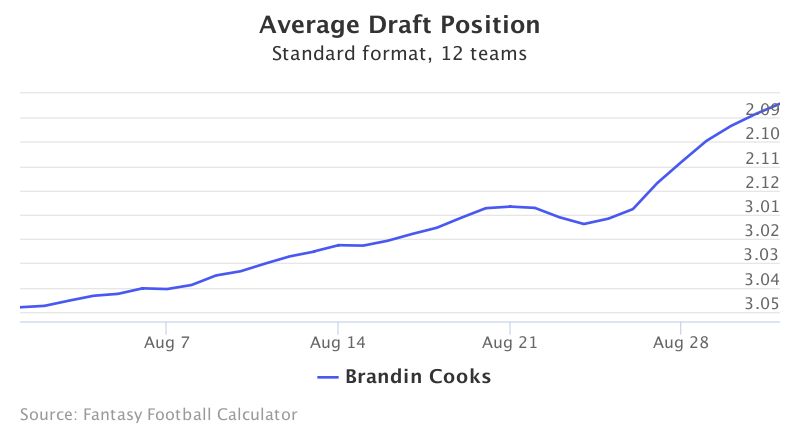 Unfortunately Cooks fits the profile of a player that could fall quickly. WRs this century with under 80 receptions have less than a 10% chance of repeating top ten seasons, and Cooks had 78. He also scored 58 of his points in just two games and would’ve finished WR18 without one of those games and barely in the top 40 without both. These numbers paint the portrait of someone reliant on big plays to find value, someone maddeningly inconsistent from week to week. Cooks is more of a deep threat than a possession guy anyways. It’s likely Danny Amendola or Chris Hogan who may benefit more from Edelman’s absence. Cooks is not a reliable 2nd round target. Terrelle Pryor broke out last season for Cleveland, and an offseason move to Washington’s high-powered offense has owners buying the hype. Pryor certainly profiles as a breakout candidate. He has good size to rack up TDs and it’s easy to see a target boost as Washington’s lead man. But are we sure that will be the case? DeSean Jackson and Pierre Garcon are gone, but 100-target slot man Jamison Crowder is still to soak up passes and isn’t Jordan Reed the top Washington receiver? Pryor’s role is up in the air, and so is this offense with coordinator Sean McVay off to the Rams as their new coach. 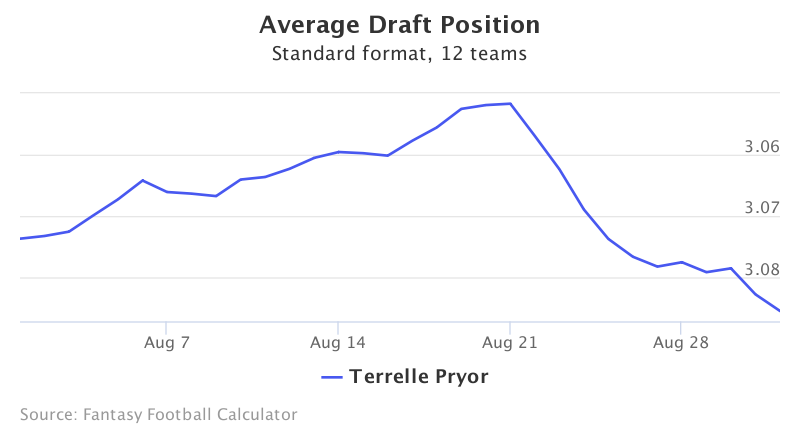 Pryor certainly could finish as WR13, but drafting him that high takes away the value of his upside. The 5'10" speedster was a surprise rookie star for the Chiefs with 12 TDs between receiving, rushing, and kick returning, and owners are paying for a high 4th rounder for Hill’s versatility and speed. Tyreek Hill is all about the big play. An incredible 55 of his 140 points last season came on just five plays?—?and nothing can save your week quite like an 80-yard touchdown. But what if teams game plan for the speedy Hill and the big plays never come? 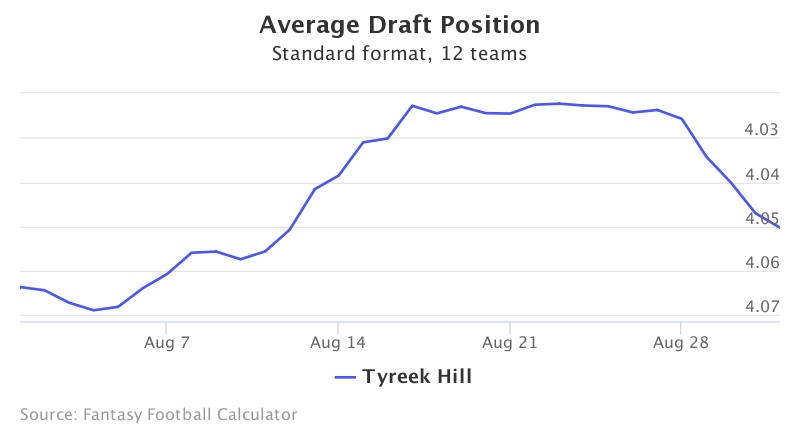 Take away those five big plays and Hill averaged just 5.3 ppg last season with nine single-digit fantasy games. His value as a runner is overrated thanks to two long runs, and you probably don’t get points for all those kick return yards anyway. In performance leagues Hill is more intriguing, but in standard leagues you should stay away. 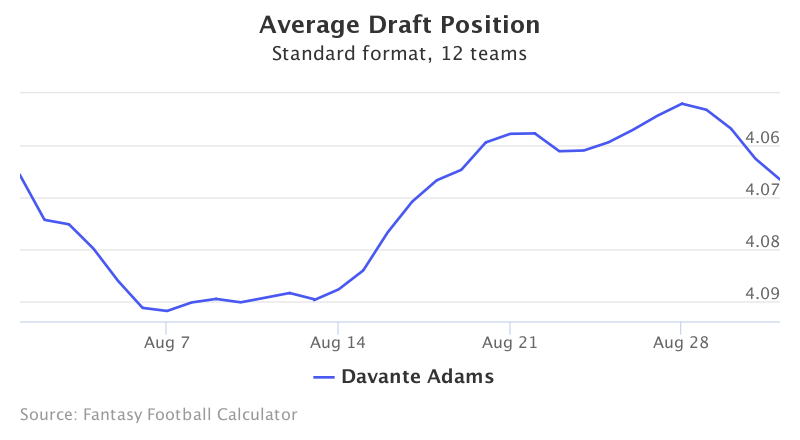 Davante Adams broke out last year with a monster 12 TD season and saved many fantasy seasons. Now he’s being drafted among the top 20 WRs. Adams saw career highs in every stat last season and his profile practically screams regression. His 4.5 TD% his first two seasons may have been a tad low, but it’ll be nearly impossible for Adams to repeat his 16.0 TD% rate from 2016. Teammates this century have finished among the top ten WRs 14 times like Adams and Jordy Nelson last season. They’ve never repeated there; in fact, the second receiver has never even finished top 20 the next season. Adams is sure to see his TD% regress, and he didn’t even hit 1000 yards last year so his value is entirely TD dependent. Stay away.